Website visitor Rob P. wrote to ask that I scan and post this article and plans for Claude McCullough's "Chariot" radio control model. The 58" wingspan high wing model features a pylon-mounted .23-size engine. Although the original used rudder-only control, no doubt Rob will use at least three channels, and maybe even add ailerons for a fourth. He may even decide to adapt the Chariot to electric power. Simple stick and sheet balsa construction helps to make for easy, inexpensive building. Hopefully, Mr. P will send a photo of his completed Chariot for posting here. 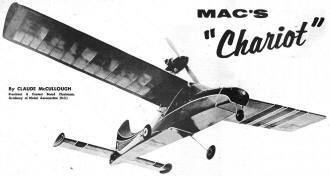 The original "Chariot" was built primarily as a sport flying model for use at R/C picnic and evening fly-for-fun sessions and the unusual layout was chosen mainly on the basis of its appeal as an interesting, out-of-the-rut project. Considering this background, I was agreeably surprised to find that the design has performance features which alone make the high thrust line conformation something for more radio control fans to sample. Most valuable characteristic is the penetrating ability in a high wind, something very necessary to successful rudder-only performance. "Chariot" will stick her nose into a stiff breeze and make headway when a more conventional job will not. Next noticeable feature is maneuvering ability with smooth, on-the-track turns without bouncy entry and pull-out. No design of equivalent size that I have flown could handle power so well. The prototype uses a .23 run full-out and I don't doubt that it could manage a .29 if necessary. Needless to say, it is a rare day when a prop is broken. Not that this can be considered a lesser advantage - as any R/C flier who has to add a half a dozen broken props to a day's fuel and battery bill can testify. 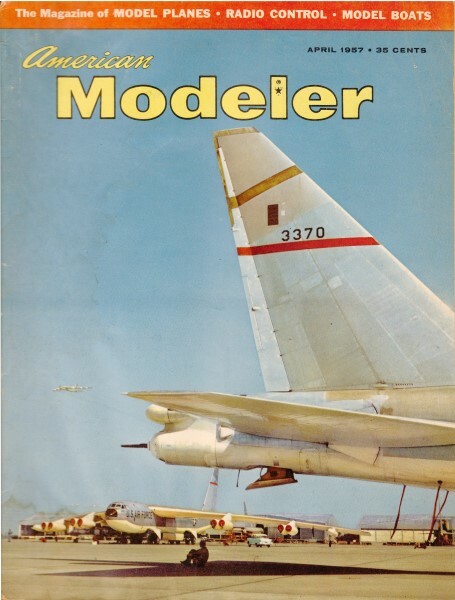 The prototype model was built from selected hard balsa, carries copious battery and equipment choices, topped by multiple coats of dope and at 20-oz-per-sq-ft wing loading can hardly be considered acrobatic. Still it is evident that a plane built to a lower weight with light equipment could more than hold its own competitively. In particular the performance suggests itself as just the ticket for the new AMA Pylon Racing Event. Modelers who see the ship for the first time invariably marvel at the pylon being able to stay in one piece, since on the original version it is made from three laminations of 1/8" balsa. The secret is the special rock hard grade from a stock Frank Zaic selected for me some years ago. At the annual Iowa R/C picnic I got to thinkering (as is my unfortunate habit) with previously worked out adjustment and snapped stalled the ship in under full power. The pylon, then fastened only at the top and bottom of the cabin, was thrown completely clear of the ship, but was not damaged at all. In repairs, 1/4" sheet wedges filled-in to the bulkheads in front and to the rear (as shown on the plan) were added and no further trouble has been encountered despite my un-coordinated style of operation, which gives the ship more than its share of hard knocks. Because of the certainty that the quality of wood I had is not commercially available now, plan shows a 1/8" plywood center with ordinary 1/8" hard balsa outside. This provides a pylon of similar weight and possibly greater strength with the addition of a more positive motor anchorage point. For the average version of the "Chariot" I would suggest a .19 motor. If you incline to heavy batteries and lots of dope, a .23 will be best. For lightweights with small radios a .15 cubic incher may be fitted but I would not recommend anything smaller. 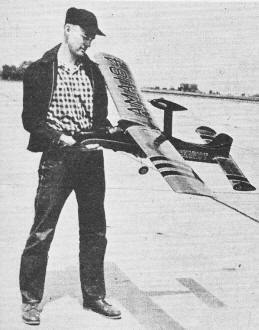 In construction I made use of one of Frank Zaic's neat aids to modeldom, the 60" R/C Wing-Stab Kit. This ingenious shortcut comes with die-cut ribs, shaped leading and trailing edges, etc. ; besides saving construction time is of the usual high quality wood that has characterized FZ's productions. This item is sold only by mail and is available from Model Aircraft Co., Box 333, Station D, New York 3, N. Y. for $3.50 postpaid. 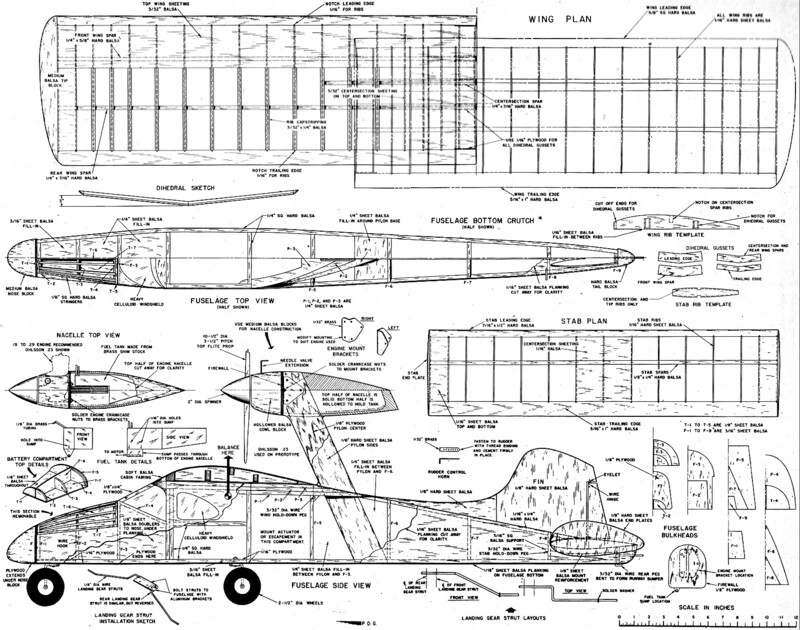 If you wish to build your own wing and stab from stock wood, full details appear on the plans. In a ship of this type one consideration must be kept in mind. To keep the C.G. in the proper spot, weight should be concentrated in the nose and saved wherever possible in the tail. Don't spare anything forward of the wing. Use the heaviest balsa and plenty of cement. This has a practical as well as aerodynamic application. The nose section takes bumps and thumps of ordinary flying that in a conventional design are mainly absorbed by the motor-firewall unit, and the extra strength is as necessary as the weight. To the rear select lightweight wood and go easy on cementing, this section is not subject to very much strain and will not require additional strength. My version used the McNabb 465-mc CR receiver - nice deal for sport flying because you can get many more flights logged by using the less crowded band and with little chance of interference. Proportional pulse is standard as far as I am concerned for rudder only flying and the results of the "Nats" R/C events give plenty of support for that preference. If you prefer another type of control there is ample space for mounting available in the actuator compartment. Cabin and nose battery box are both of dimensions that easily accommodate any standard single channel unit and most small multi-channel outfits. Because the choice of mounting is so dependent on the receiver and personal prejudice of the individual constructor, I have not specified any particular receiver installation-you can easily adapt your favorite setup. Fuselage is basically built upon the bottom crutch of 1/4" sq. balsa, but instead of the usual method of building the crutch first and then assembling the rest of the body on it, I believe it best in this case to build two sides over the fuselage side view composed of just the bottom longeron and the square forward cabin section - the part on either side of the cabin window. After these have thoroughly dried, the crutch bottom is completed over the fuselage top view. Cabin top is completed with 1/4" sq. cross pieces. Add Formers F-1 through F-9 to the crutch, using a right triangle to align them correctly. Next step is to plank the bottom of the crutch with 1/16" sheet balsa - 1/16" plywood being used under the nose section, as well as in the area where the rear landing gear is mounted. Prepare the pylon for assembly by bolting the 1/32" brass motor mounting brackets to the 1/8" plywood center. The crankcase nuts, or radial mount adapter nuts if your motor has this type of provision for radial mounting, are soldered to these brackets so that the motor may be removed easily at any time. Cement the 1/8" hard balsa sheet outside pieces on under pressure until very dry. Use hot fuel, proof cement for this application as well as any other near the motor nacelle or pylon. Cement pylon to the fuselage bottom and secure in place at the top by assembly of the platform pieces P-1, P-2 and P-3. Add the 1/4" sheet fill-in wedges to brace the pylon to F-5 and F-6. Fill in around the base of the pylon with 1/4" sheet. Motor nacelle is completed by install­ing 1/8" plywood firewall and the balsa block cowl and nacelle sections. Top half is left solid to add rigidity to the motor mounting, bottom half is hollowed for installation of the fuel tank. This is of necessity rather odd in shape, but is not difficult to make from brass shim stock. Carrying the fuel in the nacelle is a recent change in the airplane. Originally it used a Walker Pressure Tank in the nose compartment feeding a regulator in the nacelle through several feet of fuel tubing. Perhaps it was my application and operation of this device but I got rather erratic results from this long distance pipe line and switched to direct fuel feed which has given consistent motor operation. The slightly different nacelle shape is better from an appearance point of view than the original shape. Fuselage is prepared for planking by shaping platform pieces P-1, P-2 and P-3 with a knife to conform to the fuselage contours. Run a sandpaper block along the crutch and shape it to blend in smoothly with the change in fuselage shape. This requires an increasing angle as you move toward the rear section. Install all of your equipment mountings and make provisions for control hookup to the rudder at this point. Plank the entire fuselage with 1/16" sheet balsa and cement the 1/8" sheet fin in place. Leave the cabin windshield and windows until after covering and decorating. Compartment cover for the battery section in the nose is built separately from 1/8" sheet section T-1 through T-7. It is held in place by a rubber band in hooks in the fuselage side. Nose plywood bulkhead "F" and the solid block nose are added finally and shaped to the fuselage contours. When the ship was first built a tricycle landing gear was used. A characteristic of the high thrust line layout is a nose-down tendency, one of the reasons for the good penetrating qualities. This resulted in rather long takeoff runs however and it was not long before I had switched to a two-wheel nose gear. There are cynics locally who say this was another attack of an ailment to which I have at times succumbed, known as "multiple-wheelitis." But if, you will not buy a four wheel gear for your version on the basis of takeoff tracking characteristics then consider the punishment that a short single nose wheel must absorb. The two-wheel nose gear simply can take it better. I prefer the landing gear bolted in place with light aluminum brackets instead of cemented so they may be easily moved or modified if you are experimentally inclined. If you elect to use a Wing-Stab kit there will be little time needed for this portion of construction since these deals practically fall together. Since the construction used is simple and straight forward you will not have any trouble making up duplicates from the magazine plans if you prefer to do so. Note that several .different types of ribs are required - you can modify your rib template accordingly as the proper number of each are cut. There are several minor changes from the standard wing-stab kit that should be noted. 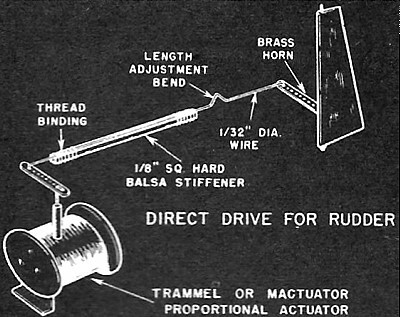 The dihedral used was reduced from 3 1/2" under each tip to 3". This amount has been quite adequate and gives smoother turn recovery than higher angles. The solid balsa stab tip of the kit has been replaced with an endplate of 1/8" sheet balsa. A small fillet of scrap balsa block is used to blend the cabin front into the wing. Prototype was covered with red dyed silk and doped with clear butyrate dope. Decorations are black with silver pin-striping, applied with a ruling pen, ruler and french curves. Secret of successful pin-striping with a ruling pen is keeping the pen clean by dipping frequently in thinner, wipe and refill with fresh dope. While it is often said that a design flew right off the board, this can't be said of "Chariot." The first flights revealed what I already knew by hand balancing - the C.G. was too far back. Moving it forward by shifting batteries and actuator ahead quickly remedied this. If you take care to mount everything as far forward as it can be stowed you should be able to hit the point indicated on the plans without any trouble. If you can't do it any other way, ballast the nose block with lead - but this resort will be necessary only if you have gone overboard building the tail and fuselage rear. My original used no thrust offset. If any are required it would be slight right thrust to counteract torque and upthrust if it is desired to increase the climbing angle. Don't try to increase the climb by changing the stab incidence unless of course the glide also shows signs of being too shallow. Four pieces 1/4" x 1/4" x 36" balsa fuselage longerons, cabin frame; (1) 3/16" x 3" x 36 fuselage formers; (1) 1/8" x 2" x 36" hard pylon outside; (2) 1/8 x 3" x 36" fin, stab endplates, nose fill-in, compartment top; (5) 1/16" x 3" x 36" fuselage planking; (1) 1/8" x 1/8" x 36" compartment top stringers; (1) 1/4," x 3" x 36" platform pieces, fill-in; (1) 1/16" x 1/4" x 18" fuselage backbone, 3" x 3" x 18" block nacelle, nose. Following balsa if Wing-Stab kit is not used: (3) 5/16" x 1" x 36" wing, stab trailing edge stock; (2) 5/8" x 5/8" x 36" wing leading edge; (5) 1/16" x 3" x 36" wing planking; (1) 7/16" x 1/2" x 36" stab leading edge; (2) 1/8" x 1/4" x 36" stab spars; (5) 1/4" x 7 1/16" x& 5/8" x 36" wing spars; (5) 3/32" x 1/4" x 36" wing cap strips; (1) 1 1/4" x 1 1/4" x 10" wing tips. Also: 6" x 12" x 1/8" plywood pylon center, firewall and nose former; 6" x 12" X 1/16" plywood fuselage bottom, landing gear mount; (1) 18" of 3/32" steel wire wing, tail pegs; (1) 36" of 1/8" steel wire landing gear; (1) 3" x 3" of 1/32" sheet brass motor mount brackets; (4) 2 1/2" dia. sponge aluminum hub wheels; (1) 2" aluminum or plastic spinner. Cement, silk or tissue, clear dope, colored dope, heavy celluloid sheet, landing gear mounting and motor bracket bolts. 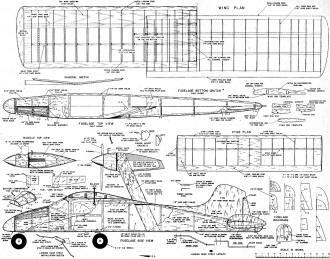 Full size plans for "Chariot" are on Group Plan #457A from Hobby Helpers. 770 Hunts Point Avenue, New York 59, New York (50c).